Researching Australian Aboriginal Winged Figures. One of the biggest challenges facing me in this series was to find winged figures in the mythology of the Australian Aborigines. this is no small feat as there are countless tribes all with separate belief systems (occasionally shared between neighboring tribes). to add to the difficulty, not much is documented or analyzed with these sites. sadly a great many stories are not recorded online, but are still maintained locally. Short of touring the entire country, my research has been largely hit and miss. I’ve talked to archaeologists and anthropologists, usually without results. I browsed rock art sites at random trying to find some sources, some ideas. Then, eventually I found two. One definitely has glider wings but the other shares similarities to other sites I’ve seen around the world and other artistic styles depicting wings. are they wings? noone else seems to be speculating and I have had no luck contacting the local tribes. Byamee (Baiame) is a local sky creator god of the tribes of the sandstone regions of New South Wales. he is an all-father figure and after creating everything went back to live in the sky. he is drawn with extra long arms and hanging protrusions that look to me to be like Raked Wings (similar in style to works found in Africa and North America and even Ancient Anatolia). as I can’t prove this theory I feel strange including him in my next exhibition but I wanted to share my research. I will be pursuing this further until I can gain some answers. In the meantime I have a minor spirit. Warraguk, a harmless spirit who roams the bush by day searching for Mormo or sugarbag. at night he hides in swamps or hangs like a bat from trees. Warraguk is shown with glider wings like a Flying Fox bat or a Gliding Possum. Here, again, we see speculation and misinformation run amok as the word Mormo is laden. Anthropologists agree that it is the local word for Sugarbag (anything pertaining to bees -but mostly honey), however in other cultures the word mormo means a demonic figure. this has been interpreted as some to mean white people or a devil creature. a theory that many feel comfortable agreeing with thanks to his bat like wings. I’ll stick with the interpretations offered by the professionals. sometimes it is a challenge to separate legitimate theories from the crackpot internet theories. I was inspired by this piece to create this render. 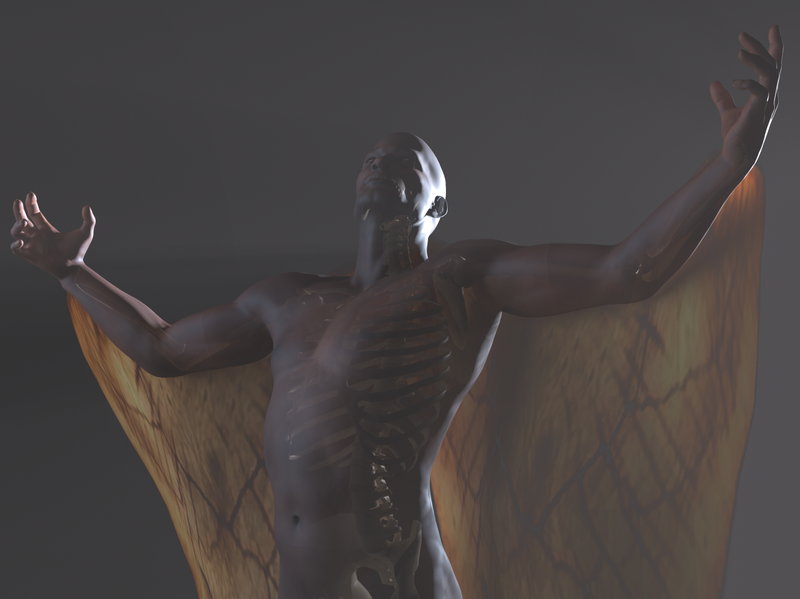 I hand modeled the wings and individually posed the bones in the skeleton. as x-ray paintings are one of the most widespread and unique styles of Aboriginal art I chose to acknowledge this in a realistic manner. it will be a challenge to paint, but I believe it will also be a unique piece inspired by classic Australian Aboriginal Art.